The Community Advisory Committee (CAC) is a representative group of residents and stakeholders who ensure that community voices, visions, interests, and feedback are heard and considered in the development of the Plan update. Providing feedback on work products and helping to refine materials for presentation to the community at large. Informing their constituent communities about the process, the issues, and opportunities for participation. Encouraging their communities, organizations, and others who live and work in the planningarea to attend community workshops, events, and public hearings. Representing views of the community and their constituents. opportunities made available to all members of the public. Who are the CAC members? Members of the 25-seat CAC were chosen from a pool of applicants who represent diverse community perspectives, including property owners, renters, residents, business owners, developers, local advocacy and community groups, representatives from Historic Preservation Districts, transit riders, youth, and others. When will the CAC meet? 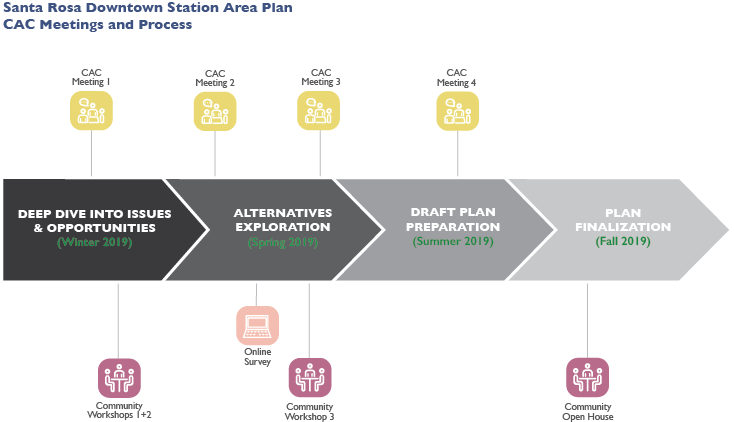 The CAC will meet four times over the course of the project timeline. Meeting dates, times, and details will be posted to the calendar as details are confirmed. Meeting 1: Kickoff meeting scheduled for Monday, March 4th at 6:30 pm, 637 First Street, across from City Hall. Click here for the agenda.